cDepartments of Radiology and Imaging Sciences (B.J.M., E.A.R.J. ), University of Utah Health Sciences Center, Salt Lake City, Utah. BACKGROUND AND PURPOSE: Multiple methods have been used to determine the lumbar vertebral level on MR imaging, particularly when full spine imaging is unavailable. Because postmortem studies show 95% accuracy of numbering the lumbar vertebral bodies by counting the lumbar nerve roots, attention to lumbar nerve morphology on axial MR imaging can provide numbering clues. We sought to determine whether the L5 vertebra could be accurately localized by using nerve morphology on MR imaging. MATERIALS AND METHODS: One hundred eight cases with full spine MR imaging were numbered from the C2 vertebral body to the sacrum with note of thoracolumbar and lumbosacral transitional states. The origin level of the L5 nerve and iliolumbar ligament were documented in all cases. The reference standard of numbering by full spine imaging was compared with the nerve morphology numbering method. Five blinded raters evaluated all lumbar MRIs with nerve morphology technique twice. Prevalence and bias-adjusted κ were used to measure interrater and intrarater reliability. RESULTS: The L5 nerve arose from the 24th presacral vertebra (L5) in 106/108 cases. The percentage of perfect agreement with the reference standard was 98.1% (95% CI, 93.5%–99.8%), which was preserved in transitional and numeric variation states. The iliolumbar ligament localization method showed 83.3% (95% CI, 74.9%–89.8%) perfect agreement with the reference standard. Inter- and intrarater reliability when using the nerve morphology method was strong. CONCLUSIONS: The exiting L5 nerve can allow accurate localization of the corresponding vertebrae, which is essential for preprocedure planning in cases where full spine imaging is not available. This neuroanatomic method displays higher agreement with the reference standard compared with previously described methods, with strong inter- and intrarater reliability. 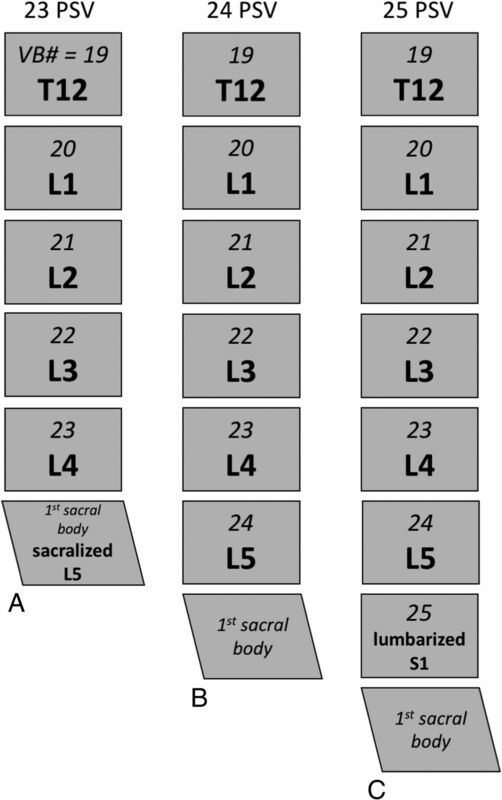 Multiple imaging modalities have been used to evaluate LSTV and VNV, with MR imaging found to be most reliable.18 Anteroposterior radiographs have demonstrated high intermodality agreement with MR imaging.19 Studies show that one can accurately number the vertebrae by counting down from C2 to the sacrum on sagittal MR imaging by using a cross-referencing tool.1,8,19,20 Although most counting methods have focused on the ossified structures, 1 postmortem study numbered the vertebrae by dorsal spinal nerve morphology and found up to 95% probability that the lower spinal nerves correspond to their respective spinal segment.21 We hypothesized that nerve morphology on lumbar spine MR imaging would aid in L5 vertebra localization, particularly when full spine imaging was not available. We aimed 1) to determine whether MR imaging morphologic features of the lumbar nerves could be used to distinguish the lower lumbar levels and 2) to apply these characteristics in localizing the L5 vertebra. This retrospective study, performed over 7 months, was approved by the institutional review board and investigators were compliant with the Health Insurance Portability and Accountability Act. We searched our picture archiving and communication system for patients aged 18 years and older who had MR imaging of the full spine and radiographic imaging (CT or radiographs) of the thoracolumbar and lumbosacral junctions within the last 4 years (2013–2016). Patients without these studies were excluded. Patients with congenital vertebral segmentation anomalies were also excluded because of the possibility of associated nerve anomalies. The indications for most of these studies were back pain and metastatic disease, and patients were included if the osseous structures and nerves could be delineated. Two investigators, a neuroradiology faculty member (L.M.S.) with more than 10 years' experience in spine imaging and a neuroradiology fellow (M.E.P. ), reviewed each case and documented the total number of presacral vertebrae by counting down from C2 to the sacrum on MR imaging. Radiographic images of the thoracic and lumbar spine were reviewed to document rib count as well as evaluate transitional anatomy at the thoracolumbar and lumbosacral junctions. O'Driscoll staging22 and the Castellvi method23 were used to classify the lumbosacral anatomy. The level of the iliolumbar ligament and L5 nerve were also documented in all cases. Graphic demonstrating our method for vertebral body numbering. When counting down from C2, patients with only 4 lumbar-type vertebral bodies (sacralized L5) have 23 PSV (A), patients with 5 lumbar-type vertebral bodies have 24 PSV (B), and patients with 6 lumbar-type vertebral bodies (lumbarized S1) have 25 PSV (C). The L5 nerve was identified by using 3 anatomic characteristics. First, L5 is typically the only lumbar nerve that does not split proximally and was identified on MR imaging by its nonsplitting course (Fig 2). Second, the insertion of the L4 peroneal branch along the lateral aspect of the L5 nerve, commonly seen at the level of the sacrum in patients with normal anatomy, was a helpful characteristic (Fig 3). Finally, the caliber of nerves along the sacrum aided in localization; specifically, the nonsplitting L5 nerve was approximately twice the caliber of the L4 peroneal branch at the level of the sacrum. This sign was particularly helpful in thinner patients, in whom the psoas muscle obscured the exiting L4 nerve (Fig 4). Schematic demonstrating the divisions of the lumbosacral plexus. 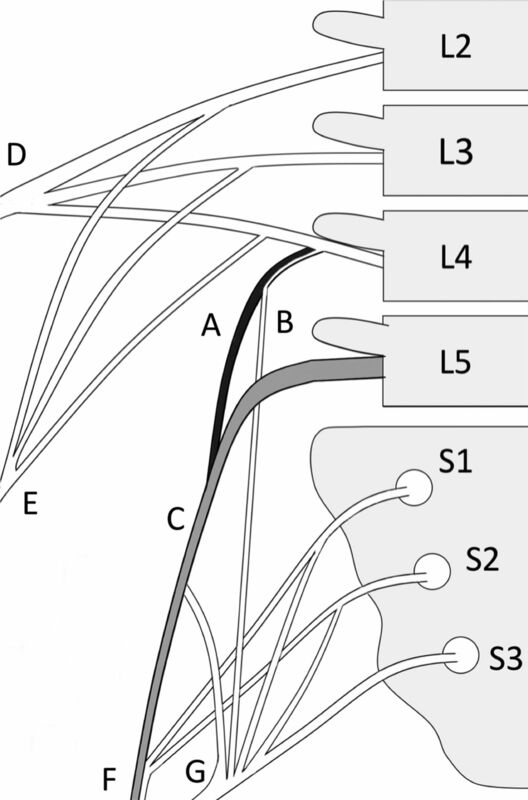 The L4 nerve divides soon after exiting the neural foramen into peroneal (black) (A) and tibial (B) components, with the peroneal component joining the lateral fibers of L5 (gray) (C). The L4 nerve also contributes to both the femoral (D) and obturator (E) nerves. L5 is the only lumbar nerve that does not have a proximal division. Branches of L4–S2 make up the common peroneal nerve (F), and branches of L4–S3 make up the tibial nerve (G), which together comprise components of the sciatic nerve (not illustrated). The MRI morphology of the L4 peroneal component and L5 nerve are of special importance for localization; thus, they are shaded in this figure. Consecutive cranial to caudal axial T2-weighted MR images demonstrate L4 and L5 nerve root anatomy. The L4 nerve root splits proximally into tibial and peroneal branches (solid arrows). The peroneal branch extends caudally and joins with the L5 nerve root (dashed arrow) along its anterolateral aspect at the level of the lateral sacrum. 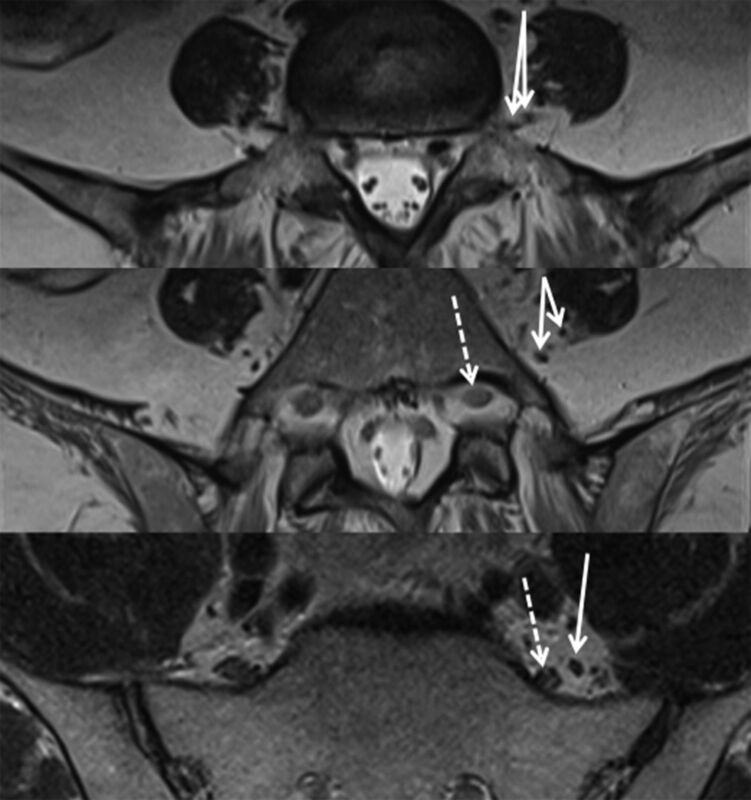 Axial T2-weighted MR images at the level of the sacrum with corresponding graphics demonstrating how the caliber of the nerve roots along the sacrum can be used to identify the number of lumbar vertebral segments. In patients with 4 lumbar segments, the L4 nerve root is seen splitting over the lateral sacrum (A, arrows). In patients with 5 lumbar segments, the peroneal branch of L4 joins the L5 nerve root, which is twice the caliber of L4 (B, arrows). In patients with more than 5 lumbar segments, 2 nerves of similar caliber will be seen along the lateral sacral wing, representing L5 laterally and S1 medially (C, arrows). Five blinded raters of various stages of training, including 2 residents (2nd year and 4th year), 1 junior faculty member (1 year postfellowship), and 2 senior faculty members (5 and 7 years postfellowship) from both neuroradiology and musculoskeletal radiology subspecialties reviewed all 108 MR imaging lumbar spines in random order on 2 occasions, separated by 2 months. Before reviewing the cases, the raters were given a brief tutorial on lumbosacral plexus anatomy, MR imaging nerve appearance, and the method of nerve morphology numbering. Each rater was asked to localize the L5 nerve on lumbar spine MR imaging and determine normal (5 lumbar-type vertebral bodies) or LSTV anatomy (ie, lumbarized S1 or sacralized L5) by using the nerve morphology method and lumbosacral osseous anatomy. No other imaging was provided. Those results were compared with the reference standard as determined by full spine MR imaging. Patient sample size was determined by the rate of variant anatomy in the population with more than 100 patients chosen to achieve a 95% CI. Descriptive statistics were calculated for PSV. To verify the reliability of the nerve morphology method for denoting L5, we determined at which spinal level the L5 nerve exited and expressed this as a percentage agreement with the reference standard labeling. Although the κ coefficient is more widely familiar, it has an anomaly when data are clumped into 1 cell of the cross-tabulation table between raters. Therefore, the more relevant and appropriate prevalence-adjusted bias-adjusted κ, or PABAK, was used to measure interrater and intrarater reliability, which gives the true proportion of agreement beyond chance agreement regardless of unbalanced data patterns.24 Although a formula for computing the PABAK interreliability for more than 2 raters simultaneously is not available, using the mean PABAK and range of confidence limits provides a reasonable approximation of the interrater reliability of the 5 raters simultaneously. Statistical analyses were performed by using commercial statistical analysis software (STATA Statistical Software: Release 14; StataCorp, College Station, Texas). One hundred eight patients were randomly selected from this data base inquiry (60 females). The combined subject group ranged in age from 18–90 years (mean, 51.9 years ± 16.9). The female patients ranged in age from 18–90 (mean, 50.1 years), and the male patients ranged in age from 29–87 (mean, 54.1 years). Sixteen of 108 patients had VNV (14.8%), 7 of whom had 23 PSV (6.5%) and 9 of whom had 25 PSV (8.3%). Ninety-two patients had 24 PSV (86%). Thirty of 108 patients had LSTV (29.7%) with 24 of these patients having Castellvi type 1 or 2 and 6 having Castellvi type 3a or 3b. None of the patients had Castellvi type 4. Nine of 16 patients with VNV also had LSTV. Twelve patients had hypoplastic ribs at T12, 8 of whom also had LSTV. In addition, 6 patients had 13 rib-bearing vertebral bodies, and none of these patients had LSTV. One patient had only 11 rib-bearing thoracic vertebrae and 6 non–rib-bearing bodies (total of 24 PSV) with partial sacralization of L5. One patient had bilateral cervical ribs at C7. The L5 nerve was identified in all patients and arose from the 24th PSV (L5) in 106/108 cases. The percentage of perfect agreement with the reference standard was 98.1% (95% CI, 93.5%–99.8%). This agreement was preserved in cases with LSTV and VNV. In the 2 cases that were incongruous with the reference standard, the L5 nerve arose from a lumbarized S1 vertebra, and in both of these cases, there was variant thoracolumbar anatomy with supranumery ribs at L1. The percentage of perfect agreement with the reference standard when using the iliolumbar ligament localization method was 83.3% (95% CI, 74.9%–89.8%), accurately identifying the level L5 in 90/108 cases. In the cases of nonagreement, either the iliolumbar ligament did not arise from the 24th PSV, arose from 2 different levels, accessory ligaments were present, or the ligaments were difficult to identify. Computing PABAK for all possible pairs of comparisons of interrater reliability yielded a range of 0.83–0.96. The average PABAK was excellent at 0.89 (Table 1). The interrater reliability between each rater, and the reference standard are reported in Table 2. The intrarater reliability comparing a rater's scores on 2 separate occasions is reported in Table 3. Developing an accurate and reliable method for numbering the lumbar vertebrae when complete spine imaging is not available has been difficult, especially in patients with LSTV and VNV. We found that the neuroanatomic MR imaging features of the exiting L5 nerve can allow accurate localization of the L5 vertebra. The L5 nerve can be localized on MR imaging by using the morphologic features of the lumbosacral plexus. First, L5 is typically the only lumbar nerve without proximal branching. The L1–L4 nerves all split proximally just after exiting the neural foramen. The “normal” L4 nerve contributes to the femoral and obturator nerves. A posterior fascicle of L4 joins the lateral surface of L5 proximally, eventually making up the lateral/peroneal part of the sciatic nerve. This L4 contribution to the peroneal component of the sciatic nerve is small (Fig 2). Along with L4, the L5–S2 nerves contribute to the common peroneal and tibial components of the sciatic nerve. One can follow the first “nonsplitting” nerve to determine the level of the L5 vertebral body. For example, if the first nonsplitting nerve is tracked back to the first sacral body, it supports the patient only having 4 lumbar-type vertebrae with sacralization of L5 (23 PSV) (Fig 1A). If the first nonsplitting nerve is tracked back to a vertebral body 2 levels above the first sacral body, it supports the patient having more than 5 lumbar-type vertebrae (lumbarization of S1, 25 PSV) (Fig 1C). Second, the L4 peroneal branch inserts along the lateral aspect of the L5 nerve, commonly at the level of the sacrum in patients with nonvariant anatomy. Third, the caliber of nerves along the sacrum can aid with localization; that is, the nonsplitting L5 nerve is approximately twice the size of the L4 peroneal branch at the level of the sacrum. Differences in nerve caliber along the sacrum can be useful for localization in patients with a paucity of abdominal fat where the psoas muscle obscures L4 and when there are confounding adjacent small vascular structures. In patients with 23 PSV, the larger caliber L5 nerve arises from the first sacralized foramen, and the L4 nerve divides along the lateral sacrum (Fig 4A). In patients with 24 PSV, both the peroneal branch of L4 and the L5 nerve are present along the lateral sacrum, with L5 approximately twice the caliber of the L4 peroneal branch (Fig 4B). In patients with 25 PSV, the nerves coursing along the sacrum will be of similar caliber as they represent the L5 and S1 nerve roots (Fig 4C). Given that the nerves can vary in size such that L5 may not be equal in size to S1 in all cases but slightly smaller, caliber should not be used in isolation of the other morphologic characteristics. Assessment of nerve morphology can be challenging in patients with severe neural foraminal narrowing and facet disease, which obscure evaluation of the proximal nerves, and when there is pathology deforming the nerve (eg, peripheral nerve sheath tumors or chronic inflammatory demyelinating polyneuropathy). Patients with congenital vertebral segmentation anomalies (eg, hemivertebrae) also present a numbering challenge because there may be concomitant variant lumbosacral plexus anatomy (ie, duplicated nerves). An additional potential pitfall includes when the patient's L4 peroneal branch is borderline in caliber, not distinctly <50% the size of L5 along the lateral sacrum. In these cases, one should follow the nerves proximally to determine whether 1 of the nerves divides; otherwise, additional studies (eg, CT chest and abdomen) may be helpful for vertebral body counting. This nerve morphology method works best with sequential axial images so that the nerves can be tracked to the exiting neural foramen. Different types of conjoined nerve roots may pose another numbering challenge, albeit less common.30 As is advocated by most radiologists, the imaging report should state how the vertebral bodies were numbered and if there is transitional or variant anatomy to avoid confusion for the referring clinician. Alternatively, there may be “thoracic lumbarization” in which there are 11 rib-bearing vertebral bodies and 6 non–rib-bearing bodies. In this situation, the L4 nerve may contribute the peroneal component, and the L5 nerve may contribute the tibial component to the forming sciatic nerve at 1 spinal level higher than in normal anatomy. This may not be revealing in the nerve morphology, as in our 1 patient with 11 rib-bearing vertebrae and 6 non–rib-bearing vertebrae (total of 24 PSV). A low number of the population have thoracolumbar transitional anatomy, reflecting why this nerve morphology technique works the majority of the time (95% by postmortem studies). Although using nerve morphology is not a perfect technique, it does enable lumbar spine numbering to be rapidly deduced on MR imaging and quickly provides clues for when further evaluation with vertebral counting is warranted. The nerve method is based on the morphologic characteristics of the exiting spinal nerves; however, some studies suggest that there are some variations in the “physiologic” nerve. Intraoperative electrophysiologic monitoring of evoked electromyography in patients with 24 PSV compared with 25 PSV showed that the “L6” nerve was equivalent to the S1 nerve root not only morphologically, but also physiologically as it innervated the biceps femoris.32 Seyfert33 used the cremasteric reflex in 50 male patients and correlated it to spine imaging. He found that the lumbosacral dermatome lies more ventrally in patients with a cranial displacement of the thoracolumbar or lumbosacral vertebral transition, which may reflect the variant plexus position. Kim et al34 performed selective nerve root blocks by using electrical stimulation in patients having transitional vertebrae with lumbosacral radiculopathy. They found that the distribution of motor and sensory symptoms caused by the lumbarized S1 (L6) nerve root stimulation was similar to that of the S1 nerve root stimulation in the normal configuration, whereas the distribution of motor and sensory symptoms caused by the sacralized L4 nerve root stimulation was similar to that of L5 nerve root stimulation in the normal configuration. The high interrater reliability and overall strong intrarater reliability of this method shows that it can be realistically implemented across subspecialties and is reproducible in the hands of users. Familiarity of the lumbosacral plexus anatomy is easily attained by the practicing radiologist and facilitates application of this neuroanatomic method of spine numbering. There is variability in how practitioners number the spine, without taking into account LSTV and VNV. We believe this nerve method will provide consistency in reporting between readers. Using nerve morphology can also aid in anatomic localization for symptoms that follow specific nerve distributions. This can be useful both in diagnostic studies and interventional spine procedures and is especially helpful in patients with variant anatomy. Localizing the L5 nerve is the key for preprocedural planning and typically only the osseous structures are used as preprocedural/procedural assessment modalities (eg, radiographs and fluoroscopy). Identifying the L5 nerve and determining the corresponding vertebral level will allow appropriate localization during procedures. The level of the exiting L5 nerve can allow accurate localization of the corresponding vertebrae, particularly when full spine imaging is not available. This neuroanatomic method displays higher agreement with the reference standard compared with previously described methods. The strong inter- and intrarater reliability illustrates that this method can provide consistency in reporting between readers and is essential for accuracy in preprocedure planning. Accepted after revision May 23, 2017.